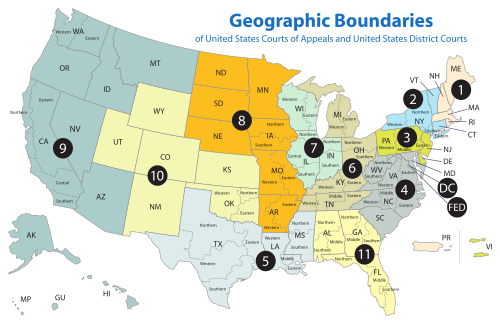 The United States District Court for the Southern District of Georgia (in case citations, S.D. Ga.) is a federal court in the Eleventh Circuit (except for patent claims and claims against the U.S. government under the Tucker Act, which are appealed to the Federal Circuit). The current United States Attorney for the District is Bobby Christine since November 22, 2017. The United States District Court for the District of Georgia was one of the original thirteen courts established by the Judiciary Act of 1789, 1 Stat. 73, on September 24, 1789. The District was further subdivided into Northern and Southern Districts on August 11, 1848, by 9 Stat. 280. The Middle District was formed from portions of both the Northern and Southern Districts on May 28, 1926, by 44 Stat. 670. The Augusta Division comprises the following counties: Burke, Columbia, Glascock, Jefferson, Lincoln, McDuffie, Richmond, Taliaferro, Warren and Wilkes. The Brunswick Division comprises the following counties: Appling, Camden, Glynn, Long, McIntosh, and Wayne. The Dublin Division comprises the following counties: Dodge, Jeff Davis, Johnson, Laurens, Montgomery, Telfair, Treutlen, and Wheeler. The Savannah Division comprises the following counties: Bryan, Chatham, Effingham, and Liberty. The Statesboro Division comprises the following counties: Bulloch, Candler, Emanuel, Evans, Jenkins, Screven, Tattnall, and Toombs. The Waycross Division comprises the following counties: Atkinson, Bacon, Brantley, Charlton, Coffee, Pierce, and Ware. ^ Recess appointment; formally nominated on January 23, 1840, confirmed by the United States Senate on February 17, 1840, and received commission on February 17, 1840. Nicoll was initially appointed to the United States District Court for the District of Georgia; he was reassigned to the Northern and Southern Districts by operation of law on August 11, 1848. ^ Recess appointment; formally nominated on December 20, 1865, confirmed by the United States Senate on January 22, 1866, and received commission on January 22, 1866. This page was last edited on 9 April 2019, at 23:14 (UTC).